In addition to many of the world’s most beautiful beaches, the Florida Panhandle is also a renowned golfer’s paradise as it is home to 12 golf courses; many of them public and a few championship. Plan your perfect beach getaway with a round of golf in the morning and an afternoon on the beach. Whatever your skill level, there is a golf course for you. Pack your clubs and make golf a part of your next Northwest Florida vacation! Russell Vacation Rentals is here to assist in any special arrangements you may need. 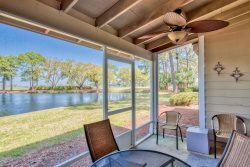 Unforgettable golf vacations along our beautiful coastline should begin with a luxury vacation condominium or vacation home in nearby South Walton or Destin, Florida. Phone the vacation experts at Russell Vacation Rentals for suggestions on where to stay, and you'll discover that your family or group can be accommodated in a luxurious vacation condo for less than the price of a hotel. Each of our unique coastal communities has their very own distinct personality, so no matter what you are looking for in a Florida vacation, you’ll find an affordable vacation condo right here.